Genuine natural (unpolished) Tibetan Quartz point, with black carbon inclusions - also known as Tibetan Black Spot Quartz. Tibetan Quartz has a beautiful spiritual energy, and they are said to carry the powerful 'OM' vibration which aligns with both the Crown and Higher Crown Chakras. They are also said to hold the sacred energy frequencies and the wisdom of this most ancient of cultures. They look and feel ancient and have a beautiful calming feel about them. They usually have carbon 'blackspot' inclusions - this one some at its heart and also at the single termination end. Also they are often Warrior crystals; ones with small nicks out of the termination where they were mined or gathered. However, this does not effect their energy or integrity one bit. This particular crystal has beautiful clarity at both ends with an included heart which also contains some carbon. 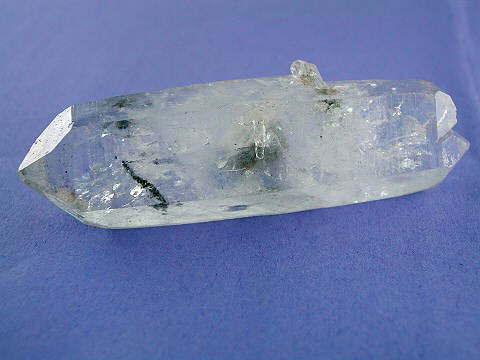 It is unusual in that it is a DT - a double terminated crystal. One end has a single termination with a tiny light-bearing rainbow and the other is a twin with a small, thin third crystal at the back. It also has a small bridge and a couple of barnacle crystals.